In the run-up to any election, attention often turns to party finance. In the US, for example, coverage of Presidential campaigns often refers to how much candidates have raised. In Britain, the sums involved are far lower. This is partly because of a tremendously far-sighted decision at the birth of commercial television to not permit party advertising on broadcast media, and partly because since 2001, the amounts that can be spent by national parties on elections have been capped following the implementation of the Political Parties, Elections and Referendums Act 2000. 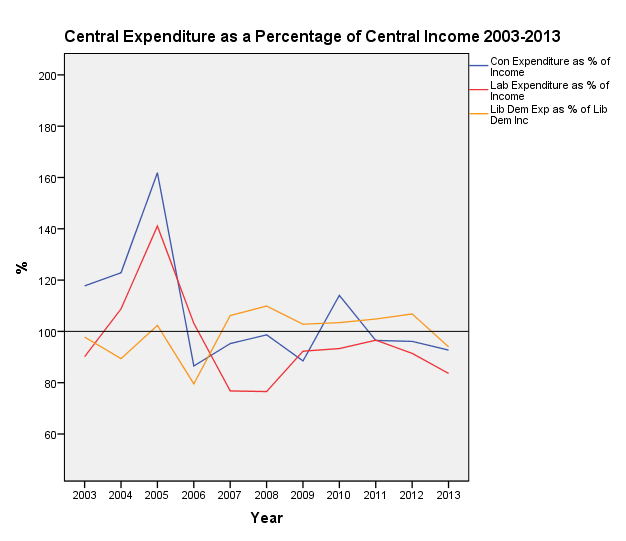 Indeed, since 2001, the permitted level of campaign expenditure has become even lower in real terms. The limit is calculated at a rate of £30,000 per constituency contested. For the major parties contesting all of the seats in Britain in 2015 the spending limit will therefore be just shy of £19 million (as it was in 2010). But the figure of £30,000 per constituency has never been adjusted for inflation, so the amount the parties are allowed to spend in real terms is steadily falling: £19 million will buy around a third less in 2015 than it did in 2000; in real terms it equates to around £13 million at 2000 prices. Over time, elections are costing less. Of course, while election spending is limited, that does not imply that all parties spend up to the limit. In 2010, Labour managed to spend only around £8 million, while the Liberal Democrats have never been able to spend anything like even that low total – they spent £4.8 million in 2010. Even the comparatively wealthy Conservatives spent quite a bit less than the permitted maximum: £16.7 million. That Conservative financial advantage was driven by the ‘return to the norm’ in the years before 2010, when the Conservatives resumed their mantle as the wealthy party – a position that had been interrupted by Tony Blair’s stewardship of the Labour Party. Since 2010, however, there are signs that this may again be changing. Up to and including the latest available accounts ending in 2013, Labour has attracted more income. As Figure 1 below shows, Conservative income after 2010 dropped off fairly sharply and though Labour’s income has been swelled by the receipt of public funds (Short money) by virtue of being in opposition, their income has still exceeded that of the Conservatives since 2010. However, declared donations to the central parties (donations in excess of £7.5k) during 2014 suggest that the Conservatives may be better placed financially come the election. Over the first three quarters of this year, the Conservatives have received £18.2 million against Labour’s £12.6 million (including Short money) and the Liberal Democrats’ £3.8 million. Other indicators also suggest that the 2015 election may see parties spending closer to the permitted maximum. 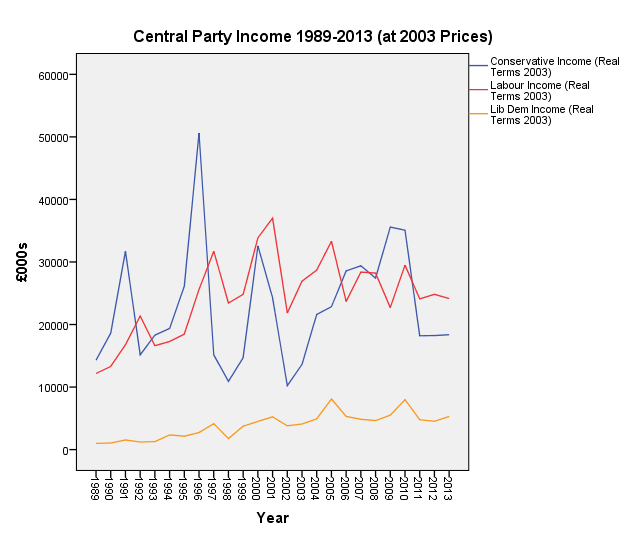 A previous trend for parties is that they have often spent much more than their income in any one year. Over the last eight years, however, that particular habit has been broken. Both Labour and the Conservatives have generally been able to contain their spending, and while the reverse has been true for the Liberal Democrats, the latest accounts (2013) indicate that they too have been able to spend less than they’ve generated (Figure 2). The result for the largest two parties is that their liabilities have fallen sharply. So, if nothing else, 2015 looks like it will be a more even spending contest between Labour and the Conservatives. The Liberal Democrats as usual will have far less financial muscle. But will this lead to electoral payoffs? The evidence, here, is decidedly mixed. At national level, there is very little evidence that increased spending by parties gives them a significant financial advantage. In part, that is a function of the growing electoral importance of constituency level campaigning, on which all parties pay increasing attention – especially in their target seats. Election expenditure at constituency level is assigned to the candidate rather than the party during the regulated campaign period. And, there is consistent evidence over time that candidates who spend more tend to perform better electorally, particularly when they are challengers. In 2010, had Conservative candidates spent the maximum possible in every seat and both Labour and Liberal Democrat spent very little, the Conservatives would have won an estimated 344 seats, enough for a working Commons majority. A similar scenario where Labour candidates spent the maximum and other parties mounted minimal campaigns would have produced an estimated 282 seats for Labour. However, what candidate spending fails to capture is voluntary effort, the labour provided for free by party activists and supporters. When this is factored in, the positive electoral effects of higher spending can be offset by the free campaigning delivered by those activists. Thus, despite the Conservatives candidates’ significant financial advantage in 2010, both Labour and Liberal Democrat candidates were able to counter this through their voluntary efforts, supplied for free. Had Labour campaigns engaged in the highest levels of free campaigning (as undertaken in their most intense campaigns) in every seat (with Conservative and Liberal Democrat campaigns being minimal), Labour would have won an estimated 350 seats (see You Get What You (don’t) Pay for: The Impact of Volunteer Labour and Candidate Spending at the 2010 British General Election). In other words, the effects of free campaigns sometimes can be greater than those based on money. So, 2015 looks like it may be a more even contest than 2010 in terms of party spending – at least for the two largest parties. And, given the closeness of the election, we can probably anticipate a great deal of campaigning, both at national and constituency levels. That’s a good thing. More intense campaigning (which, of course, costs money) has a demonstrably beneficial effect on turnout. But, we should also remember that the amount parties can spend on elections is decreasing in real terms year-on-year. That may need to be addressed if the beneficial effects of campaigning on turnout and voter education are to continue. Equally though, we should also remember that voters tend to respond positively to the human touch, which is frequently provided for free.